I didn’t need yet another typewriter. I really, really didn’t. I was just thinking to myself last night about how buying that Remington Noiseless the other week was a completely frivolous purchase that turned me from enthusiast to collector…. And then I looked at ebay. I spotted an old Royal portable a week ago. It was located about 30 minutes up the highway from my place, and it had those nice, nice glassish keys that Royal produced before moving to the ‘finger tip shape’ AKA ‘tombstone keys’. Okay. It was a model that I thought I’d like to own. So I slapped down a token amount. About an hour before bidding ended, I noticed that the bidding was almost up to my final bid price. So I had a look at the person I was bidding against. Ahhh crap. I know where this is going. What was in the description? 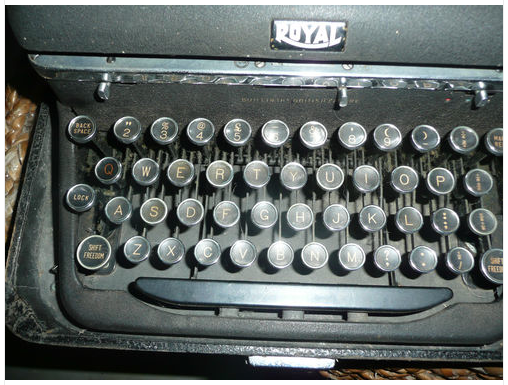 ‘Latest craze of typewriter key jewellery’. The typewriter was even co-listed in the Jewellery section. I think the dolphins were supposed to represent Coloundra, a shire on the Sunshine Coast. I felt compelled to bid. Instead of just letting it go to the keeper, I actively pursued it. I started to use aggressive tactics to get the typewriter. And in the end… I got it. I have no idea about the state that it is in, or even how well it works. I just… couldn’t find myself just letting it go; to be chopped. I’m sure I paid too much, and I’m sure I won’t do this again. I promise…. I don’t need it, I’m not even sure I know what to do with it. I already have enough projects. Oh well….. At least it’s for charity. It is, right? Typosphere… you’d do the same, wouldn’t you? Uuuurg. There’s gonna be a hangover. Even most of the pictures just focused on the keys…..
Oh no. I just won a Hermes 3000 I didn’t need. May 14, 2012 in bought, ebay, key chopper, mistake, oh dear god what have I done., royal. You have done a noble deed, Scott! Down with “jewellery”! I offer a heart-felt “Thank You!” for your concern and efforts. Quite likely, near-future typospherians will gladly reward you for your foresight in saving this. I think we need a cross-typosphere “confessions” topic: “I bought it to save it, not because I wanted it” being the prime motivation. I have a Royal I bought for this very same reason… may even be the same model. I bought a Royal Signet for the sole purpose of rescuing it from a key chopper. It isn't a great typer, but I like its looks and it is in nearly perfect condition having been in use through the 1980s. No mold or musty smells, just a nice indoor typewriter. Good job! Your descent to the dark side of typewriter collecting has been blessed by the typewriter gods! 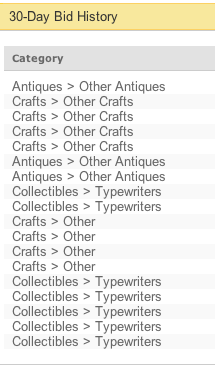 Well, I can't exactly complain about having a 'collection' of typers. They look amazing. I did manage to keep the price down a bit tactically. Who knows, this machine might come up looking brilliant. Incidentally, what model do you guys think this is? I'm guessing it's an Aristocrat. But all of those that I have seen have had rectangular shift keys. I don't know enough to guess models. My QDL has the squared shift keys. I thought that you knew the model, but now I see that you don't! Whatever it is, I hope it arrives in typing shape. I'm surprised at how nice the QDL is. I think it's been in the pile for too long. Saving the world, one typewriter at a time! I would have done the same thing. Whenever the opportunity to save a typewriter comes along, it is important to do so. If your collection ever gets to be too much, you can always give typewriters to deserving recipients and/or organizations, such as Ryan Adney's classroom. I'm getting rather close to this point, myself. Oh BTW, I think your Royal is a Touch Control or Model O? Might be my imagination.